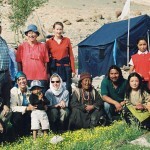 At GESAR Travel we are a specialist operator for custom-made tours. There are only a few group trips offered at fixed dates. We are planning and organizing your trips and building them from yor requests and wishes. Everyone can inquire: travel agencies, individals, couples, groups of all sizes, the young and the old, in every season; we offer trekking tours, expeditions, culture trips, photo tours, beach vacations – or a mix of all of the above. Please contact us with your requests and desires – we will build your trip for you! Via phone you can reach us best from Monday to Friday from 08:30 am to 12.00 am CET. *I agree that the data entered will by stored during the period of processing - namely to answer my request and information about requested products and services. My data will not be stored for more than three months. And should the processing of my request take longer than three months, my data will be deleted at the latest upon completion of the processing.